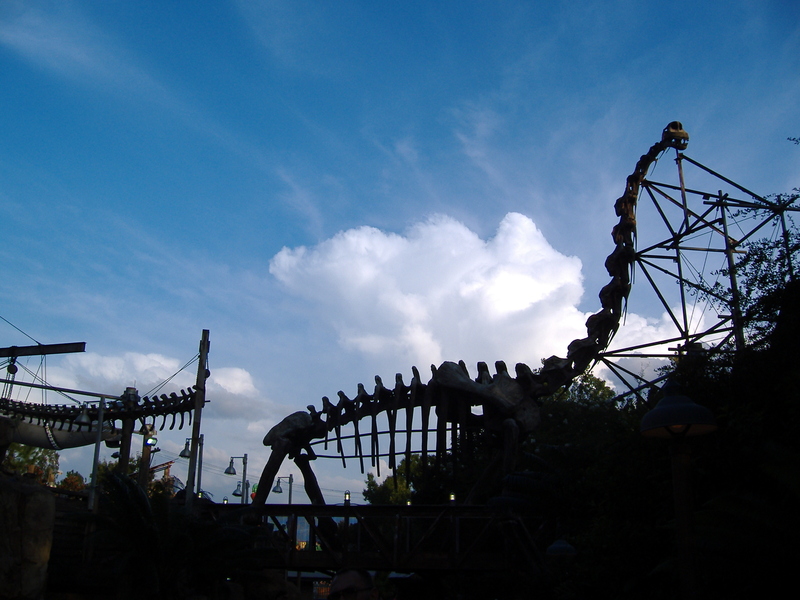 We enter DinoLand under an in-construction Brachiosaurus/Giraffatitan skeleton. 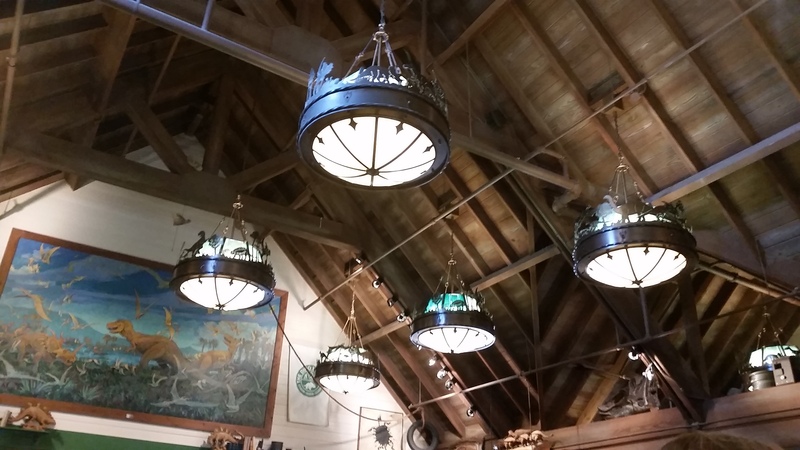 The area’s backstory is that a ragtag team of palaeontologists have made a discovery and set up shop, complete with a dig site, camp, museum institute, and hangers-on Chester and Hester with dinosaur-themed roadside attractions. 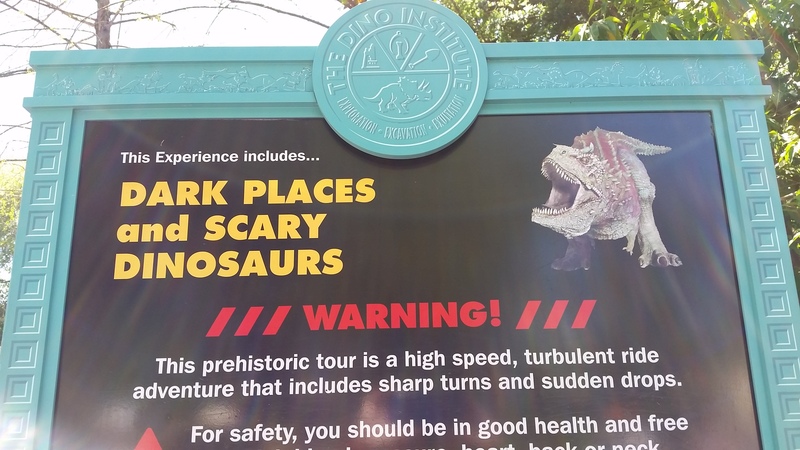 It’s a fun narrative even if it makes no sense to mount a dinosaur skeleton outside. Bulletin boards around the land feature notes and scraps from the dig team. 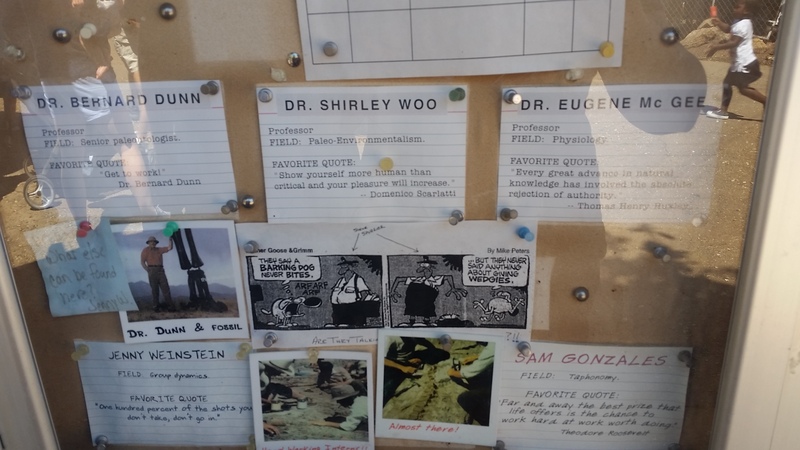 I like these jobs descriptions and field photos – anyone recognize anybody here? Looks like a pretty good job to me. 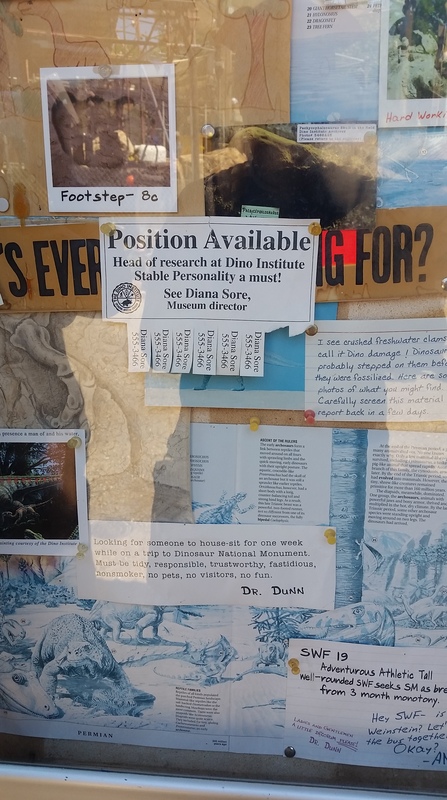 I’d apply. Aladar the Iguanodon from the 2000 film Dinosaur guards the entrance to the Dino Institute, the fancy museum that houses the thrill ride formerly called Countdown to Extinction and now catastrophically renamed DINOSAUR. 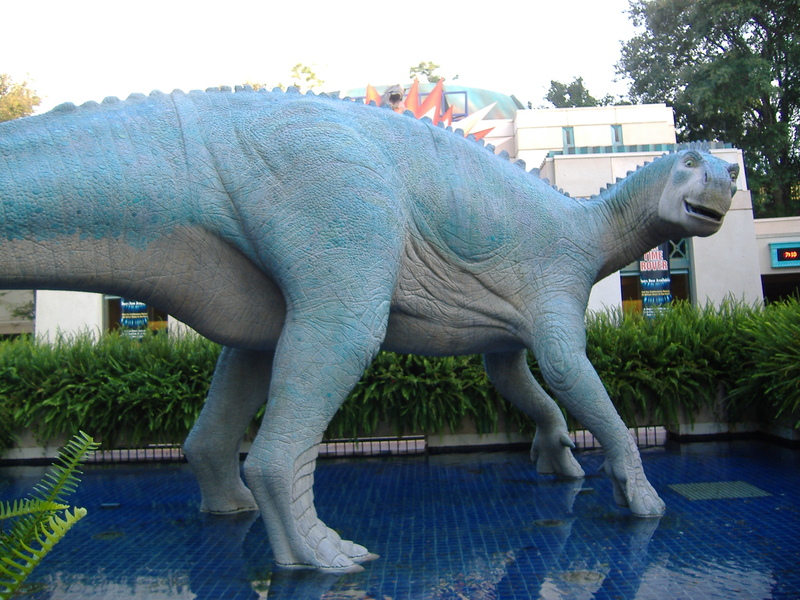 Also fun/sad fact: Aladar used to be a full working animatronic when it was placed elsewhere in the park along a waterway, but in its current position it’s just a pretty statue. Bummer. 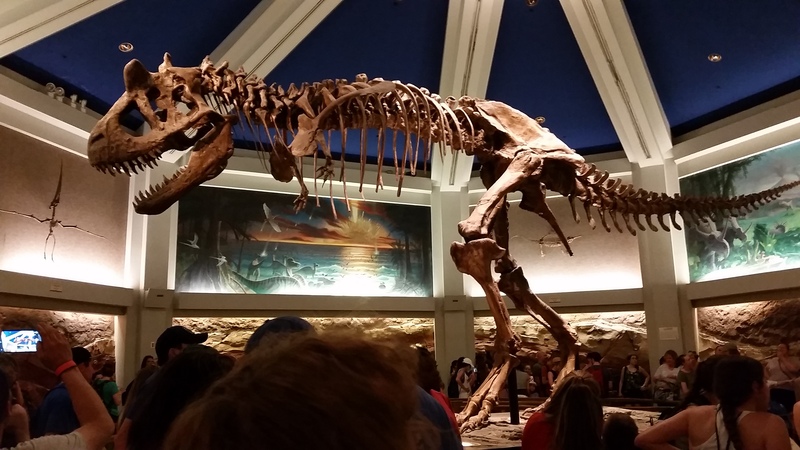 Countdown to Extinction features DARK PLACES and SCARY DINOSAURS, friends, and they aren’t kidding. Inside the museum we meet this colossal-headed but otherwise I think somewhat accurate Carnotaurus (the distinctive caudal vertebrae look about right to me). Once through this room we get to go BACK IN TIME to SAVE A SCARY DINOSAUR from DARK PLACES. I don’t have photos from inside the ride but someone else filmed it and stuck it on Youtube so here you go. Fans of William Stout’s art will enjoy several Easter eggs from his book The Dinosaurs, like the dinosaur-guzzling Alioramus. Afterwards you can shop at Chester and Hester’s DinoStore! 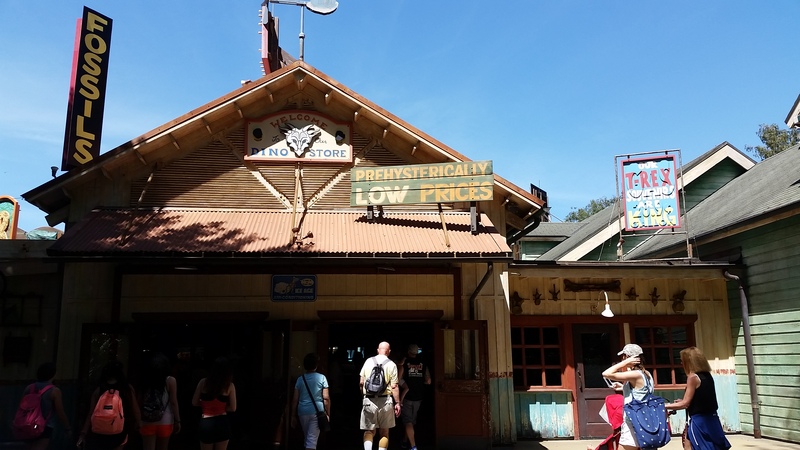 Or eat at the Restaurantosaurus, which is absolutely covered in cool dino memorabilia, including art from the Rite of Spring segment from Fantasia, and lots of other classic palaeoart. 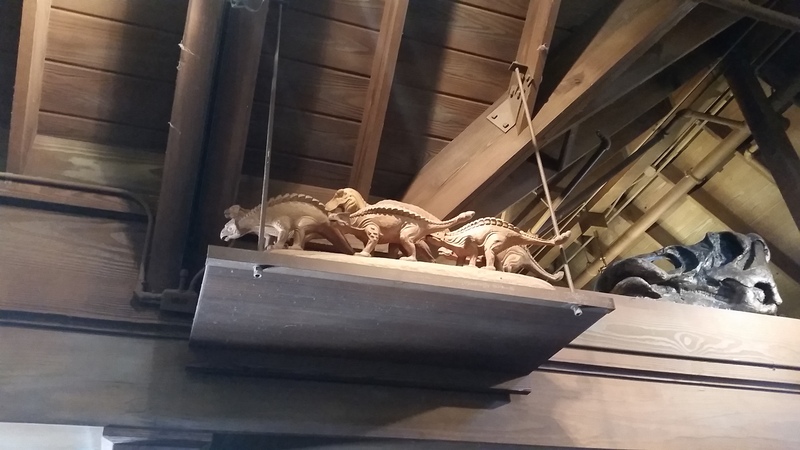 I also spotted this unusual piece jutting out from a high point on a wall – a herd of not too terrible ankylosaurs fending off a hapless tyrannosaur. I wonder if this might have been concept art or a maquette from the 2000 film, which had a long and tortuous development phase beginning in the 1980s at least (and which was originally meant to feature non-talking dinosaurs!)? 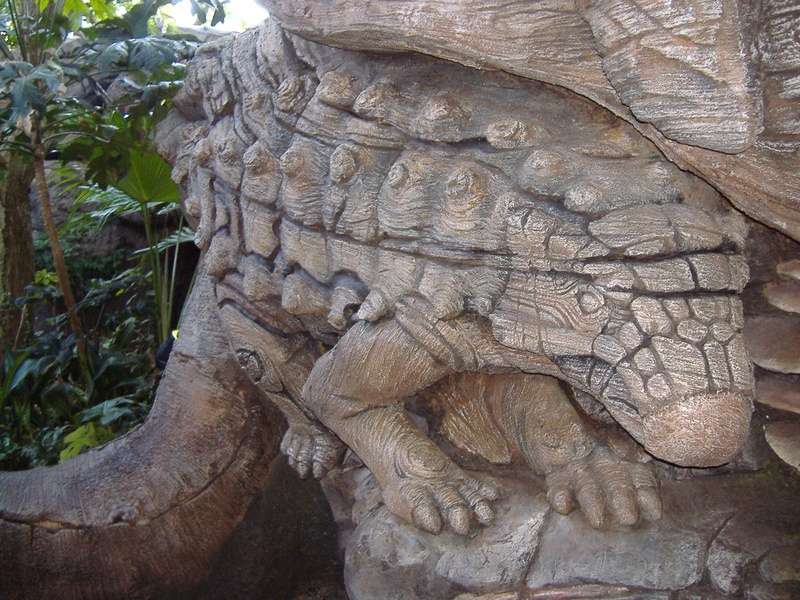 That’s it for a quick romp around DinoLand, but there’s one other dinosaur of note hiding at the Animal Kingdom – this extreme huggable ankylosaur carved into the main icon for the park, the central Tree of Life. Give it a pat for me if you visit. ← Where did all the tail clubs go?